Please join us at Florida State University’s Museum of Fine Arts for the opening of the Spring 2015 Master of Fine Arts Studio Art Exhibition! 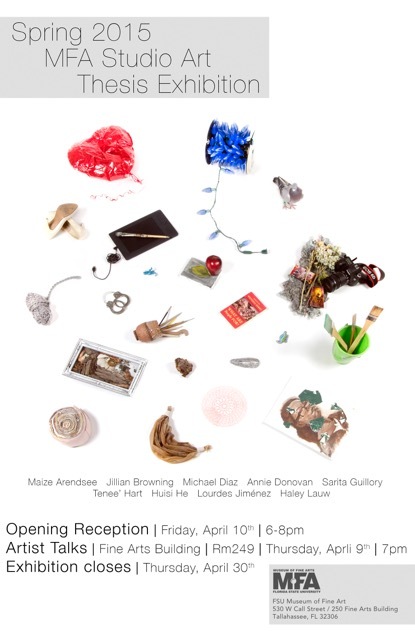 The opening is Friday April 10 from 6pm – 8pm. The show closes on Thursday April 30th at noon. The graduating artists’ talks will be held on April 9th in the Fine Arts Building in Rm 249 from 7pm to 9pm. Each talk will run about ten minutes. We hope to see you there! Maize Arendsee, Jillian Browning, Michael Diaz, Annie Donovan, Sarita Guillory, Tenee’ Hart, Huisi He, Lourdes Jiménez, and Haley Lauw.